By our count, 1,087 galleries will be trekking down to Miami this week to participate in more than 20 art fairs around the city. With that much art for sale, there's bound to be something for everyone -- if you can find it. 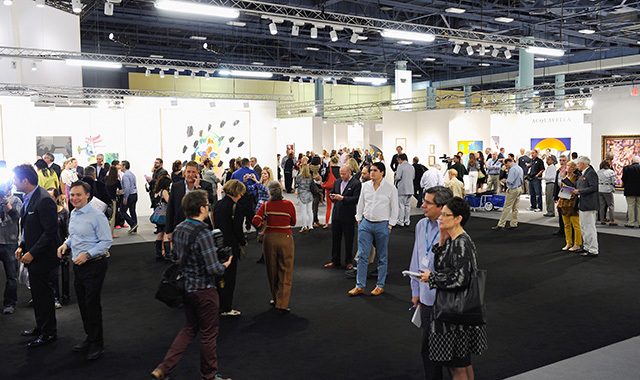 To help, we've put together a handy primer to Miami's many satellite fairs. But this one comes with a twist. If the art world, with its constant rumor-mongering and public spats, is a lot like high school, then December in Miami is the high school reunion. At the risk of oversimplifying things, we've paired each fair with a high school archetype that best encapsulates its attitude. We'll be the first to admit these analogies are reductive and inelegant: As anyone who has seen "The Breakfast Club" can tell you, stereotypes are limiting and we're all a little bit of a brain, athlete, basket case, princess, and criminal. But like high school, Miami is cutthroat and time is short, so we've glossed them for you as best we can. Happy fairgoing. The sister fair of ABMB devoted exclusively to design, Design Miami/ is attractive and entered the game with the good looks and connections to succeed without much trouble. This year, the fair is showing off its fun-loving side with a special presentation of architecture for dogs. Meridian Avenue and 19th Street, Miami Beach, December 5-9. Moving to the Deauville Beach Resort in 2010 was NADA's equivalent of building its own set: The casual venue is a perfect fit for a fair that has increasingly become a must-see for collectors looking for emerging or overlooked talent. (Art Basel Miami Beach might wear designer clothes, but NADA -- creative, cliquish, quirky and cool -- shops vintage.) Like many young thespians, the fair also has a penchant for the dramatic: When organizers learned that a couple of exhibitors had signed on to show with another fair simultaneously, they threatened to bar them from future editions of NADA -- and then later reversed their opinion. Deauville Beach Resort, Collins Avenue and 67th Street, Miami Beach, December 6-9. 12th Street and Ocean Drive, South Beach, December 5-9. Never one to step too far outside the lines, Pulse is nothing if not reliable. You know you'll find strong paintings, photographs, and drawings in an efficiently laid-out space at reasonable prices. The fair organizes its own installation, performance, and video programs, but you won't see too many galleries giving over their booths to such impracticalities. Most are more interested in making money than in making a statement. Still, that's no reason to skip over it: Like Brian Johnson in the Breakfast Club, Pulse might surprise you. As the super senior is to the football star, so Art Miami is to Art Basel Miami Beach. It is the only player to rival the golden boy in size and know-how. Plus, it's been around since before Miami was cool, and doesn't need to try particularly hard to draw visitors or exhibitors. (It was founded 12 years before Art Basel Miami Beach arrived.) Its old school attitude can border on stodgy, but Art Miami undoubtedly fills a niche: It is one of the few fairs outside ABMB where you can find secondary market material like Picassos, Matisses, and Pisarros. A new fair from the organizers of Art Miami, CONTEXT is best understood as the august fair's younger sibling. Like many freshmen, it's trying hard to tap into the hottest trends. It's got a special geographic focus on the (reliably cool) city of Berlin and a selection committee stacked with smart dealers like D.C.'s Leigh Conner and Jamie Smith. Still, the 65-exhibitor fair faces the same challenge that all siblings do: being overlooked. Occupying a 45,000-square-foot pavilion directly adjacent to Art Miami, CONTEXT risks both literally and figuratively being overshadowed by its older sister. We'll have to wait and see how its own identity develops as it matures. 3201 NE 1st Avenue, Wynwood, December 5-9. If ABMB is prom king, SEVEN is the kid who throws a rager in his parents' basement instead of going to the big dance. In this case, the basement is a warehouse in Miami's Wynwood neighborhood. For the third year in a row, this scrappy fair will host seven galleries -- Postmasters, Pierogi, Hales Gallery, Ronald Feldman Fine Arts, BravinLee Programs, P.P.O.W. and Winkleman Gallery -- for a laid-back, boothless event. Last year, SEVEN launched a New York edition in Williamsburg, Brooklyn during Frieze Week, cementing its reputation as a lovable, do-it-yourself affair a bit removed from the main attraction. 2200 NW 2nd Avenue, Wynwood, December 4-9. The frat boy may not technically be a high school archetype, but high schools are filled with future Greeks. Those rowdy, sometimes macho, always devil-may-care personalities are a good analogy for Scope. Plus, in a bizarre example of analogy collapsing into reality, some real live frat boys made an appearance at the fair two years ago in New York. (Artists Richie Budd and Will Robinson invited four New Jersey Greeks into a glassed-in cube to drink beer for hours on end and generally make mischief as part of an art installation called "Come on Guy.") We can't imagine that kind of stunt would fly at any other fair. At first glance, Seattle-born Aqua Art Miami might not look like anything special. Like many small fairs, it is based in a hotel. But if you look past its modest exterior (think Rachel Leigh Cook in "She's All That"), you'll see it has a great bone structure. You may even spot the beginnings of a very promising career or two. Lacking the PR push and brand-name backers of Untitled, the Miami Project may be relegated to the status of "the other new kid": That girl you notice while everyone else is paying attention to the more conventionally attractive new arrival. The Miami Project's interests are a bit quirkier, too: The fair promises a series of travel-inspired works from Nina Katchadourian created exclusively with her camera phone and objects available to her on an airplane. Another exhibitor, Cheryl Haines, is planning an immersive new media installation from artist Camille Utterback. NE 1st Avenue and NE 29th Street, Wynwood, December 4-9. The only geographically focused fair in Miami, Art Asia features 24 galleries from around the world that specialize in Asian contemporary art. The largest concentration of dealers hail from Korea, while others are based in Turkey, New York, Japan, China and Florida. This year, Art Asia will move to a new location; still, its biggest claim to fame may be its exhibitor Eli Klein Fine Art, whose eponymous owner had a star turn on Bravo's reality show "Gallery Girls." 110 NE 36th Street at Midtown Boulevard, Miami, December 5-9. Red Dot may not be fast or flashy enough to make the varsity fair team, but you can't help but root for it anyway. Though its New York edition was cancelled this year on account of sloppy management and union conflicts, the Miami flagship will return with 90 galleries and a section of small booths devoted to artist projects. Just as coaches scope out the junior varsity team to see who might be ready for the big leagues a few years down the line, so art advisors have been known to scope out Red Dot for unknown talents. 3011 NE 1st Avenue at NE 31st Street, Wynwood, December 4-9. The inaugural Miami River Fair was developed with a dual purpose: to sell art and do good. As the first fair in the city's downtown Brickell area, it hopes to revitalize the Lower Miami River district and its waterfront. Collaborating with the Miami River Commission, the fair will install ten large sculptures on a strip of public park adjacent to the water. One participating artist, Dr. Petra Liebl-Osborne, will anchor a floating artificial-looking swimming pool in the river. Miami Convention Center, 400 SE 2nd Avenue, Miami, December 5-9. This hotel fair is a little rough around the edges but it's not without a certain back-of-the-classroom charm. Most of the rooms are occupied by individual artists, while others are filled by small, alternative galleries. A pilot exposition spotlighting video art, film, and architecture betrays the fact that Verge may do its homework a bit more carefully than it likes to let on. Essex House and Clevelander Hotels, 1001 Collins Avenue and 1020 Ocean Drive at 10th Street, Miami Beach, December 6-9. Born of Williamsburg, this small-scale warehouse fair is all attitude. This year, it's teaming up with street art nonprofit Living Walls to mount a 175-foot-long installation on the warehouse's 5,000-square-foot lawn, where you might just catch an exhibitor sneaking a cigarette. On Saturday night, you can even pretend you're in Brooklyn at Fountain's dance party, which features musical stylings from New York's own Tiki Disco. 2505 North Miami Avenue, Wynwood, December 6-9. Operating fully outside the establishment, PooL is entirely devoted to artists without galleries. The bootstrapped fair is hosting 25 artists this year, and will feature body painting by Artem Mirolevich, chalk installations by Ellis Gallagher Follow, and sculpture by Karim Marquez. Remember: Just as not every home-schooled kid is weirdly religious, not every artist is without a gallery for good reason. Sky House Marquis, 1100 Biscayne Boulevard, Miami Beach, December 7-9. Ink and your high school yearbook photographer have a lot in common -- they are both quiet, passionate about the printed page, and interested in injecting a dose of intimacy into a sometimes-impersonal experience. Less visible than its New York cousin, the IFPDA Print Fair, Ink has been offering up contemporary fine art prints and works on paper since 2006. Suites of Dorchester, 1850 Collins Avenue at 19th Street, Miami Beach, December 5-9.